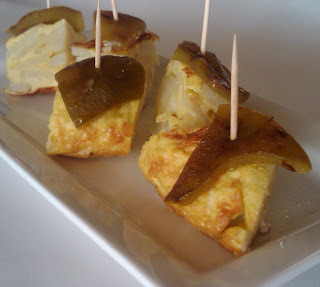 Tortilla is a Spanish favorite – a potato omelet (no similarity to the Mexican tortillas). I usually serve it in wedges for dinner (or breakfast) or 1-inch squares for an appetizer. Serve with roasted peppers or salsa. The simple ingredients make this the perfect dish to prepare when the cupboard is bare. This technique takes some practice, be sure to read through it before beginning. Heat the oil in a skillet, add the potato slices one at a time. Alternate layers of potato with layers of onion, salt the layers lightly. Cook over medium heat, turning to potatoes frequently, until tender but not brown. Lower the heat to medium. Flip the tortilla 4 or 5 more times (this helps with the shape), cooking for a bit on each side, 8 – 10 minutes in total. 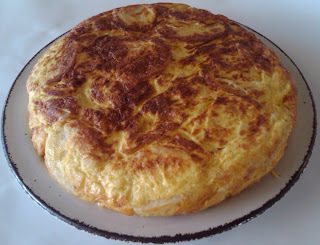 Spaniards like their tortilla to be a little juicy inside; I prefer my eggs cooked all the way through. Adjust cooking time accordingly. Transfer to a platter and serve hot or at room temperature.